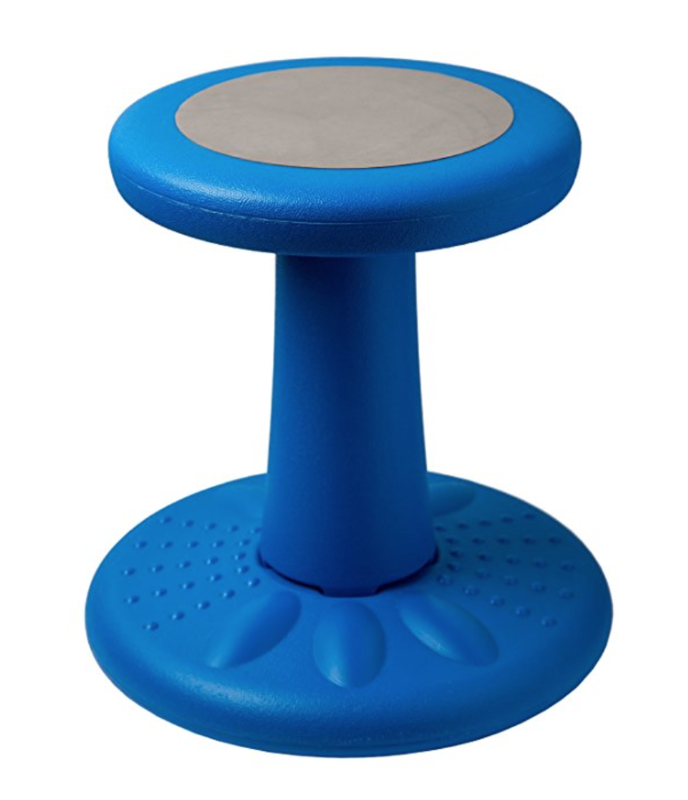 In a school I worked in, there was a grant written for the first grade to buy these Wobble Chairs for the whole class. It got me thinking about our students with CVI who need to move to see better. Might this simple solution be the answer to keep students with CVI in place but give them the movement they need? These are not expensive at around $50. Not a bad deal just to save some poor child from the continued negative feedback of “Sit down” that they hear way too often. Comes in all sizes. Have You Really Controlled the Complexity and Light? Complexity and access to distracting light and movement can completely overwhelm the student with CVI in the classroom. I have seen teachers work very hard to reduce the complexity of their classrooms. It can be a challenge but well worth every effort for our students with visual impairments due to CVI. Controlling complexity and light effectively creates accessibility to learning. This teacher has covered the shelves that are probably filled with toys and books. The shades are pulled down to control distracting light sources. The floor cover is a nice non-complex background for looking at materials placed on the rug. A nice start! BUT: look at the shelves in on the left side of the room. The black cover controls the complexity on the shelves but the complexity remains with the many colorful and complex materials stored on top. 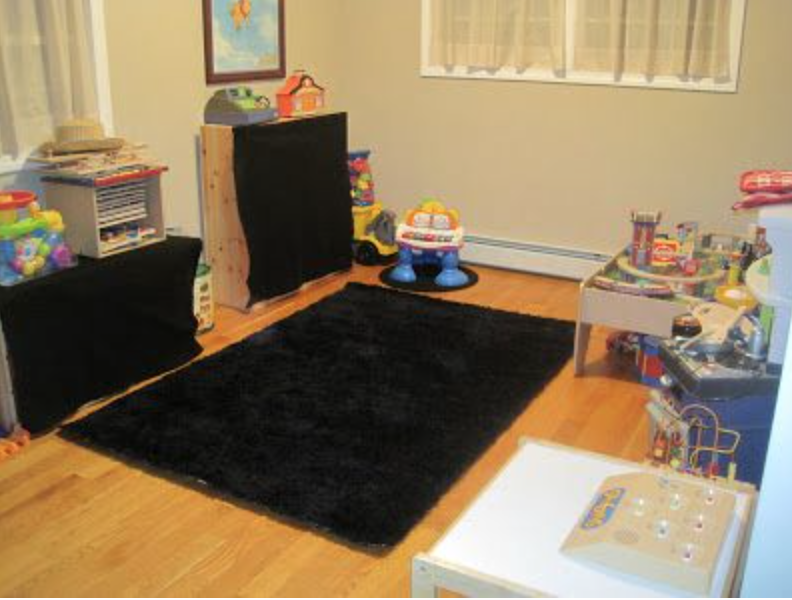 If those toys were removed, that left side of the room would be a much less complex background against which to learn. (Complexity of Array: Roman-Lantzy). That is, of course, if that is the way the student in facing in the room! If the student is facing the right side of the room or learning in the middle of the room, that would be completely overwhelming and complex. If the student is facing this way and this is the background, the student would really struggle against this complexity of array. This side of the room is completely inaccessible for learning for the student with CVI. Here is a challenge for everyone as you return to school from the holiday break. Pick a student in your class who has CVI. Think about every position you place that student throughout the day. Actually sit there. Is the background where the student is facing free of complexity? If not, rethink your adaptations so the whole room is adapted. Would there be a better place to face? Would learning against a wall rather than in the middle of the classroom be best? Accessible learning is from the student’s point of view not from ours. I had a request for some morning meeting ideas for children in Phase I as measured on the CVI Range (Christine Roman-Lantzy 2007). The concepts and vocabulary around “Characteristics” and “Phases” come from Dr. Roman-Lantzy’s work. The first place to start, of course, is to assess the child using the CVI Range. This is the only functional vision assessment for children with CVI. Understanding the child’s functional visual skills allows you to create goals and objectives and to provide across-the-day accommodations and methodologies to meet those needs. Phase I: Goal: Building Visual Behaviors. Providing access to use visual skills around the 10 characteristics. Materials in morning meeting must meet the color preference. This is not always red o yellow. Your assessment will tell you the preferred color. Because this child is very visually impaired, compensatory skills should also be considered. Items presented must be 3D, real objects NOT PICTURES! 3D objects will provide visual access, tactile input, olfactory input and auditory input. Pictures are completely inaccessible for this child who is not using central vision effectively. (Central vision is essential for children to understand any 2D materials). Materials in morning meeting must meet this assessed need for movement of the presented materials to foster visual use. Shiny items are considered under the Movement characteristic since the reflected light from the surface looks like movement. Movement should be gentle and slow not fast and frantic. Reflexes are reflexes and cannot be taught. There are no accommodations for visual reflexes. To foster looking at the presented morning meeting materials, light must be controlled, limiting the child’s lightgazing. Because light is important to encourage looking, light the materials that are presented or use materials that light up. Because fixation is brief, the material must be presented for longer so the child has another opportunity to visually locate. Because peripheral fields are stronger than central visual fields, the materials must be presented off center in the best assessed lateral visual field. (The child in Phase I will have a distinct preference for one lateral visual field). The lower visual fields are often not functional well into Phase III so eye level is recommended. Upper fields can also be inaccessible. Make sure the “action” of morning meeting is within their best assessed visual field. The child can only look at items in near space. The exact assessed distance needs to be respected and materials presented within this distance. At this Phase, this is typically within 18”-24” of the child’s eyes. Give the child a copy of the material being used with other child in turn. This provides visual access for the child even when materials are being presented to other children at greater distances. The child rarely looks to faces (Complexity). Faces are very complex. This child will have difficulty looking at faces. Be mindful that the child may be attending but not able to make eye contact or even look towards your face if you are talking. Greet them with your name and tell them what you will be doing with them. Call their name before delivering a message or asking a question. Research shows that adults often do not talk as much or as long to children without eye contact. Adults should be aware of this and monitor their behavior with children. Create morning meetings of less children so the movement, visual complexity and auditory complexity is more controllable. There is no rule that morning meeting needs to be all the children in one morning meeting. Have several smaller meetings. Provide non-complex backgrounds for all learning materials. Where non-complex shirts. You are the the visual background! Seat yourself in the same position as the child to see what the child sees. You will be surprised how much visual complexity you will notice and need to control. Position this child solidly for best visual skill use. Use consistent materials to build visual familiarity. Predictable routines in morning meeting will support visual recognition of materials and help children predict the sequences. The child will have latency for looking and latency for understanding what is seen. Using the assessment and taking data will help identify how long the child requires for visual attention, which visual field is faster and which visual field has the most sustained visual attention abilities. The material needs to be where the learning is accessible and for as long as the child requires. Here is an interesting video about a woman with a brain injury. As she recovered some sight, she is first able to see rain since it was moving. She progresses to seeing other kinds of things moving in the world. Movement is so important for some children with CVI!